A Worthing mother has thanked an anonymous Elvis impersonator for helping her stranded son. Debbie Vaughan Baker’s 16-year-old son, Max, was riding his motorbike near Asda in Ferring on Wednesday night (September 19) when the chain snapped. After failing to get through to a breakdown service, Max was faced with an hour’s walk in the dark to push the bike back to his home in Friar Walk, West Worthing. Luckily, a long-sideburned good Samaritan showed up to lend a hand. After passing Max in his car, Debbie said, the anonymous helper told him to wait while he went home to Goring to get his van. People with more suspicious minds may have been wary of the offer, but the predicament had left Max all shook up. “It took him 20 minutes to get the van so Max went to a cash point to get money for petrol but the man wouldn’t take it,” she said. 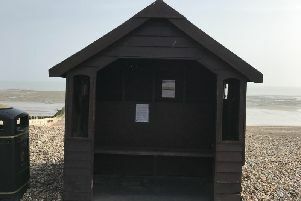 Debbie posted the story on several community Facebook groups in a bid to find the unknown benefactor, and the revelation that he is an Elvis impersonator from Goring is sure to narrow the search. “I thought I’d post it on the Facebook pages because you don’t hear many good things on them,” Debbie said, adding the man was a motorbike enthusiast himself. Debbie has contacted local impersonators of The King, but to no avail, so has urged the man to get in touch.